Medreonet is a EU funded coordination action aimed at the enhancement of surveillance of Culicoides- transmitted diseases: Bluetongue, African Horse Sickness and Epizootic Haemorragic Disease. Medreonet is focusing on sharing and exchanging data, expertise, experiences and information via regular meetings, maintain and expand surveillance systems, setting a European database including surveillance, disease occurrence, virus isolation and vaccine use. It will also focus on diagnostic and control tools and ensure wide dissemination of information to all concerned parties. Note that Medreonet is neither funding research activities nor substituting to national surveillance framework. 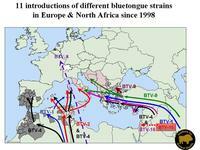 As pointed out by Dr P Mellor (IAH, EU reference lab) during Medreonet Kick off Meeting (Montpellier, 31/01 to 02/02/2007), 11 introductions of BT strains were recorded since 1998 around Mediterranea and Europe. Molecular analysis of the strains involved showed that there exist different serotypes that have been introduced but also that inside the group formed by a serotype different strains can be identified. This highlight the need for a better exchange of strains between research institutes allowing more in depth analysis of the relationships between strains, origins.